The Android ListActivity makes it simple to display a list of items in your application. If the main purpose of a screen (Activity) in your mobile application is to present a list of choices or content to the user, use ListActivity instead of Activity. If all you want to do is display a list to the user and nothing more, you don’t even need to create a layout definition for the activity. The ListActivity has a default layout that provides a ListView for you. However, if you wish to customize the way your ListActivity looks, the single required element in your layout definition is an object with an id of @android:id/list. If your layout doesn’t have an object with an id of @android:id/list when you go to launch your application, you’ll be greeted with a “The application … has stopped unexpectedly. Please try again.”. Looking at the debug output, you can see that the exception raised states “Your content must have a ListView whose id attribute is ‘android.R.id.list'”. Now, that’s not very exciting, since all it will give us is a black screen when you try to run it. In order to provide the ListView with content to display, you need to associate a ListAdapter with the ListView. A ListAdapter is essentially the data source object that the ListView pulls its rows from. 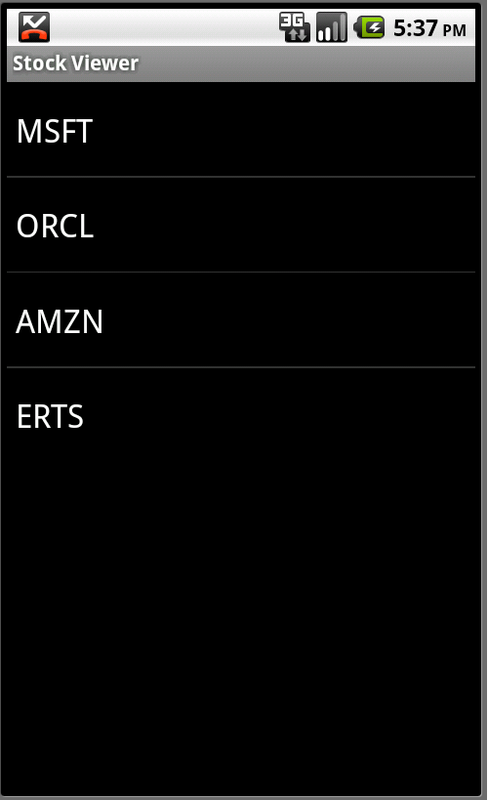 For now, let’s just display a static list of stock ticker symbols from an array. The Android framework provides you with the ArrayAdapter class that makes it straightforward to assign an array to a ListView. You can add the static list stock ticker symbols to the ListView by placing the following two lines of code after the setContentView call. It was extremely straightforward to add the ticker symbols to the list mostly because this example used the Android framework’s ArrayAdapter and simple_list_item_1 TextView resource. The reference to android.R.layout.simple_list_item_1 is simply a single TextView, so using this resource limits you to only displaying a string of text in the list item. What if you wanted to display the ticker symbol and the latest quote? One option would be to simply append the quote on to the end of the ticker symbol (i.e. MSFT – 25.48); however, that means that you’re stuck with the same formatting and layout for both pieces of information. This entry was posted on Saturday, April 2nd, 2011 at 5:55 pm	and is filed under Android. You can follow any responses to this entry through the RSS 2.0 feed. You can leave a response, or trackback from your own site.